I live with three dogs and four cats. For the most part, it’s a peaceable kingdom. So what if the cats sleep in the dog beds or if my dogs think that mouse toys are meant to be shredded. 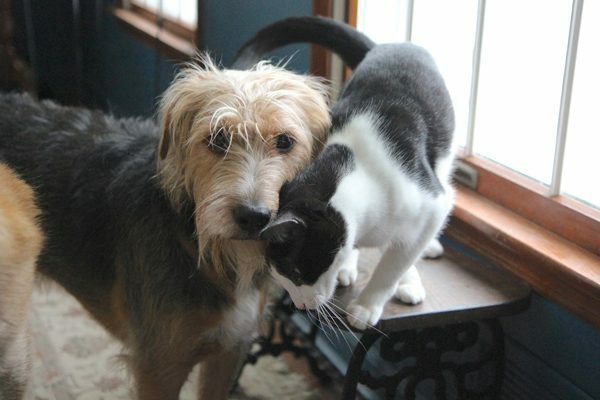 The joys of living with both dogs and cats outweigh the small challenges of an interspecies household. Except for the part about the dogs eating the “snacks” they steal from the cats’ litter boxes. And, in case it’s not clear, by “snacks,” I mean cat poop. My dogs must think it awfully nice of the resident felines to consistently leave these gifts in their boxes. Darned if my dogs don’t feast on feces and come right over to me with poo-poo breath and want to kiss my face. Talk about potty mouth. I had to figure out a way to stop this disgusting habit. Experts say you should have one more litter box than you have cats. So four cats means we have five litter boxes in our home. All are in rooms with closable doors: in bathrooms, the basement, and one in my son’s room where one cat spends most of her time. 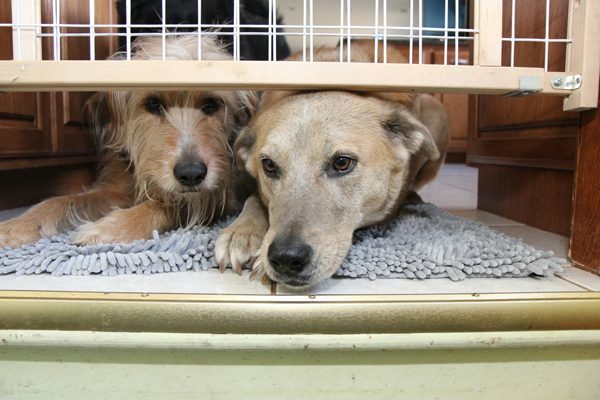 At first, to keep the dogs out, we used a combination of door stops and braces. I put a brick or other heavy object on the inside of a door to make it difficult to open. That meant every time humans left the bathroom, we had to perform an awkward combination of reaching around the door while pulling the brick toward us and simultaneously closing the door just the right amount so that a cat could fit in but a dog could not. It was not a practical or sustainable solution. Then we tried using a combination bungee cord and make-shift door stop. It worked, but only for a little while. For our terrier Tucker in particular, the cat poo was too much of a temptation. He learned how to barrel his way right into the bathrooms. It didn’t matter how heavy the barrier object was. The poosnacks and stink breath continued. We tried pressure-mounted baby gates, blocking off access to our laundry room and the bathroom where the most-used litter box was kept. The gate was secured about 5 inches off the ground, high enough for a cat and maybe a dog nose to go under, but not an entire dog. That worked, kind of. The gate also prevented humans from coming and going easily. Every time we left the house, did our laundry, walked out the back door, or used the downstairs bathroom, we had to take down the gate and put it back up. Eventually, we found a special door latch that my husband installed, drilling holes in the door and the jamb. The latch had a long metal hook that kept the door open just enough for a cat to fit through, but not for my dogs. Experts also say animals like to work for their food, which is the thinking behind offering your dogs (and cats) food puzzles. Tucker took the latch setup as a conundrum to be solved. Which he did; he learned that if scratched and banged at the door long enough, he could dislodge the hook. It was a game of constant one-upmanship. That’s when I realized that solving the problem wasn’t going to be simply about preventing access. I needed to address the behavioral issue. Thus I began to train my dogs to stay away from the litter. I reinforced the Leave It command — which they already knew — by putting a treat in front of them, and rewarding them with a better treat when they ignored it. I also taught them the Wait command. A variation on Stay, Wait means don’t go past a certain point. A dog can sit, stand, even walk around, but not go beyond a doorway or a fence. In our case, I used it to keep the dogs out of the bathrooms when I cleaned the litter. In the meantime, we made a special effort to keep the litter boxes very clean. We made sure to empty them of potential treats before we left the house, as our smart little terrier had figured out he had a better chance of getting away with a successful poop retrieval mission while we were away. In addition, I began exercising the dogs more before we left, keeping them busy and active. I also give my dogs a small snack right before we walk out the door. This combination means they are more likely to sleep, and less likely to perpetrate poop pilferage. Then I found a door latch that Tucker isn’t able to bang open. The Door Buddy (I received a free sample, but was not paid to write about it) allows doors to stay open just the right amount. 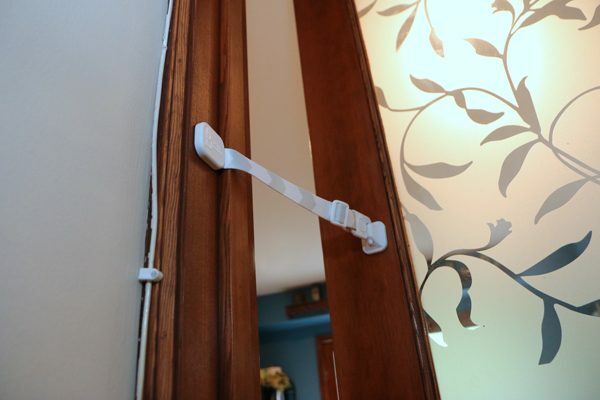 They’re adjustable, inexpensive, and can be installed without tools. I now have one on every door that protects a litter box. Eventually, we were able to stop using the gate, and just relied on the Door Buddies. Every once in awhile, one of our dogs manages to find and consume a cat poo; usually it’s due to someone forgetting to latch the door. But for the most part, I can enjoy doggy kisses once more, without worrying too much about what my dogs have been snacking on. Teach your dog the Leave It command to stop him from eating the poop. Teach your dog the Drop It command, in case you’re a little too late, and she’s already got a cat poo in her mouth. Teach your dog Wait, and don’t allow him into the litter box areas, especially while you’re cleaning them. When you’re at home, keep your dog busy and active, so she won’t get bored and thus more likely to look for trouble. Make sure litter boxes are clean, particularly before you leave home. Consider using gates or a latch like the Door Buddy. Two others I have found are the Peek a Boo (that’s the one I started with) and the Latch’nVent. Don’t punish your dog if he eats poop; use only positive reinforcement in your training. While some people use litter boxes with covers as a way to prevent dog snacking, it isn’t an optimal solution. Many cats don’t like to be enclosed while they’re taking care of business. Particularly in multi-cat households, cats like to be able to see what (and who) is around them, and to feel safe when they are at their most vulnerable. Plus, it smells pretty bad inside a covered litter box, which must be awful for those sensitive little kitty noses. If possible, put the litter boxes up high, where a cat can go, but a dog cannot. 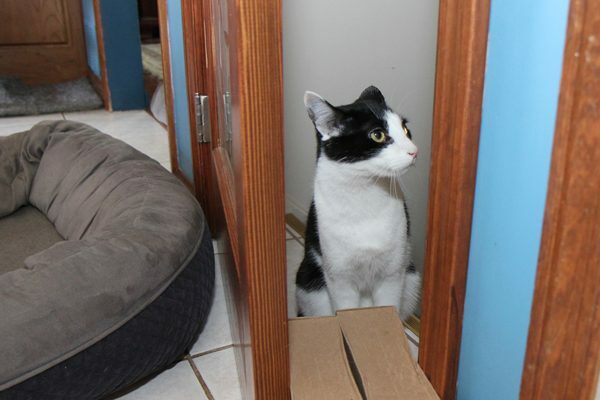 A somewhat expensive solution is to use a cat door that allows the cat into a room, but not your dog. 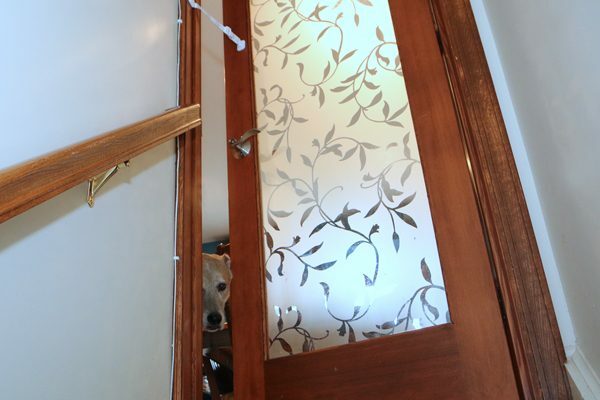 Doors made for indoor use are available; they use a pet’s microchip to open it, thus controlling access if you have a small dog that is similar in size to your cat. Experiment with several different combinations of blockade solutions to see what works best for you and your pets, but make sure you use positive training techniques as well. About the author: Susan C. Willett is a writer, photographer, and blogger whose award-winning original stories, photography, poetry, and humor can be found on the website Life With Dogs and Cats. She lives in New Jersey with four shelter cats (including Calvin T. Katz, the Most Interesting Cat in the World) and three dogs (all rescues) and at least a couple of humans — all of whom provide inspiration for her work. In addition to Life With Dogs and Cats, you can find more Lilah, Jasper, and Tucker (and the rest of the gang) on Haiku by Dog™, Haiku by Cat™, and Dogs and Cats Texting™. 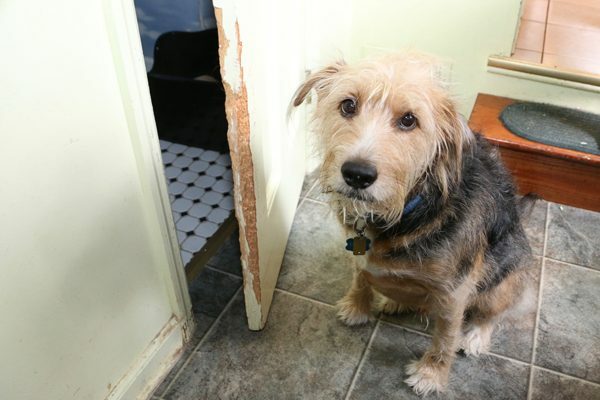 The post How I Stopped My Dogs From Eating Cat Poop Out of the Litter Box appeared first on Dogster.